This photo, taken at the end of Magazine Street, about a mile from my mother's home and only two blocks away from New Orleans' Audubon Zoo, says it all. The building is a former corner grocery, deli and sandwich shop. This area was not flooded. This is wind damage. This photo was taken on my weekly trip into New Orleans to salvage a carload of belongings from Mom's house. Residents are slowly trickling back into the city. It will be a long, long time before most of New Orleans looks like anything besides a war zone. New Orleans remains predominantly empty and eerily silent, with only the sound of the occasional car, military vehicle or debris truck passing by. While I was loading a box of Mom's clothes into my Volkswagen, I heard southbound geese honking overhead. That's right. I heard them. I looked up, expecting low-flying, feathered 747s to be directly over my head. They were not. Instead, I saw a skein of about twenty Canadian geese in a ragged V, urgently flapping their way southbound at the usual altitude. That's how quiet it is in New Orleans. It is quiet the way the desert is quiet. Quiet like an empty house -- you can hear your own voice echoing off the neighbor's houses. Walking back from the car, I could hear Mom's neighbor, Clint, listening to a news radio program. It was a fine October day, so his windows were open. Clint has moved back home and is one of the few people living full-time on Mom's block. Out in Mom's backyard -- or at least the junk pile that used to be Mom's back yard -- I could hear him walk across the wooden floor of his apartment, cough, sneeze, open and then close the refrigerator door. I heard an aluminum can go, "pffsst." He came out onto his porch, followed by his dogs. He wore a T-shirt, shorts and Birkenstocks, and was carrying a can of Coke. "Y'all doing okay?" he asked in a cheerful, mellow tone. I told him we were packing a carload and waiting for the FEMA inspector. I told him the Army Corp of Engineers had failed to notice the "obstruction" on the roof when they taped their checklist to Mom's door. "You mean the pecan tree?" Clint said, astonished. "They didn't see the pecan tree?" We laughed and shook our heads. I patted his dogs. He told me he'd set his fridge at the curb when he got home and was lucky enough to be able to find a small, dormitory-type refrigerator to replace it. His landlord, so far, has refused to replace anything. The ceiling of Clint's apartment is leaking because the roof is gone from the apartment above his. Those tenants came in to salvage some belongings, piled what was ruined at the curb, and went back to their temporary digs out of town. The Corps of Engineers gave them a blue roof tarp, but it still leaks a bit when it rains. We commented on the silence. No car alarms, no air conditioning compressors cycling on and off, no songbirds, no airbrakes from the city busses, no earth-shaking teenage car stereos. None of the usual urban audio mishmash. The shipping docks a few blocks away are silent. The loading stations at the docks and grain elevators are silent. There is no ambient traffic noise. Each passing vehicle is an individual audio experience. The only steady sound is the breeze, and an occasional human voice or barking dog. But signs of life and occupancy are beginning to show. Some stores are open part time. The neighborhood bakery and coffee house is open. So is a neighborhood sandwich shop. The grocery is supposed to re-open next week. A convenience store, although the shelves are mostly empty, has some chips, bottled water and soda. They also have fuel -- not scandalously expensive, either. The city is starting to relax a little, too. Quite a few taverns are open for business -- after all, this is New Orleans -- and a few restaurants are open as well. The curfew is now only from midnight till six a.m. Military humvees, which were cruising around last week with the doors removed and four heavily armed soldiers to a vehicle, are now riding around with the doors on, and only one soldier riding shotgun. The perfume of the city is slowly transitioning from Flood Funk to Rotting Garbage as residents deposit their ruined refrigerators and freezers at the curb. When your fridge has been sitting for six weeks, full of groceries, with no electricity, you don't empty it and clean it with bleach and a scrub pad. You sling about forty yards of duct tape around it and deposit it at the curb, or in the median if your street has one. The medians (called "the neutral ground" in New Orleans) have become the unofficial dump sites for the citizens of the Big Easy. I have learned a lot of things about the refrigerators of New Orleans in the past several weeks. 1. There are way more refrigerators on any given city block than you would think possible. There must be people living in laundry rooms and attics. 2. Freezer-on-top, fridge-on-bottom is far more popular than side-by-side or any other style. 3. White refrigerators. New Orleanians really like white refrigerators. 1. How many Great Pyramids could you build? 2. Would they reach the moon if you stacked them all atop one another? 3. How many times would they go around the Earth at the Equator? 1. Could we landfill the entire city and raise it to, say, 85 feet above sea level, if we compressed the fridges and started filling up the Big Soup Bowl we call home? 2. Could we use them like bricks in the world's most amazing levee system, made entirely from recycled refrigerators? Come to think of it, we also have about 350,000 ruined cars and busses to throw in this pile, too. It would take a lot of duct tape, but we could do it. It seems like most of the contents of many residents' homes have been piled at curbside. Any given street looks like a landfill with an aisle down the middle for cars to pass through. Even in the rare neighborhoods where houses were not invaded by floodwater, at least half the homes suffered sufficient roof damage to have earned a heavy-duty blue plastic roof tarp courtesy of the Army Corp of Engineers. These houses display large piles of mildewed belongings at the curb. And that's just what's been set outside by the relatively small number of people who have already come home to stay, to clean up, to rebuild. I placed a bunch of junk from Mom's yard at the curbside. The FEMA guy showed up. His name was John Swider and he was exceedingly nice to my mother. He, too, was amazed that the Corps of Engineers had not noticed the pecan tree engulfing the rear of the house. He made note of the fact that the fallen tree had wrecked the utility connection, which is why Mom has no electricity even though her neighbors finally got their power about a week ago. He informed my mother that her house would be unsafe to live in until the tree was removed, any needed repairs were made to the roof beneath it, and, most importantly, until the utility connection was inspected and repaired so the house would not catch on fire. Mom signed some papers and the FEMA guy went on his way.. 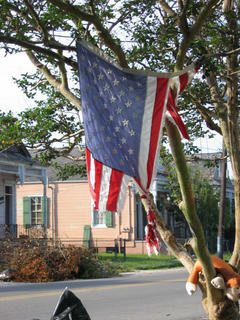 While cleaning up his own yard after Katrina, Clint found this flag on the ground, shredded and knotted by the wind. He hung it carefully from the small crepe myrtle tree in his front yard. Clint put the flag on the tree. Katrina put the stuffed animal in it. In the background, you can see a pile of brush in front of the neighbor's house across the street. The family in the adjacent house cleaned up their yard and carted off the mess. What you don't see is cars parked along the street. To me, the street looks amazingly wide. Only a native New Orleanian can fully appreciate the true magnitude of vacancy in the city if there are places to park. The people in the pink house in the background had little damage. In fact, most of the houses on that side of the street suffered only minor roof damage, lost shutters and a few broken windows. The grass is about a foot tall after marinating in the knee-deep flood water which covered the streets, but it didn't rise high enough in this part of town to invade houses, unless they were newer homes -- built on slab foundations -- or ground-level apartments beneath older homes. Mom's side of the street (the side where the flag is) is heaped with garbage bags and debris. Three doors down, the young couple living in the ground-level apartment of a two-story home had piled nearly all their belongings at the curb. When we drove off, they were hauling out a roll of dripping, reeking carpet. They wore masks and gloves. Garbage bags, bottles of bleach and other cleaning implements were stacked on their patio table. They waved at us. Their dog wagged his tail. So very sad, so very amazing. I am proud of my hometown. I will be back to read more you blog is interesting! I'm not sure about these other comments but I wanted to compliment you on "Nuff Said". That's the neatest piece of writing I've seen in sometime. Beautifully done! Kudos. Really appreciate you keeping us up to date on the NOLA scene. Is there anything your Mom needs here in BR? You have my email address if yes.